The Mount Shasta Wilderness Avalanche & Climbing Advisory - excellent site updated regularly by Forest Service rangers. Check current conditions before you visit Mt. Shasta. List of books currently in the Horse Camp library. Visit The Sierra Club Foundation's informative website!!! Shasta Alpine Lodge is a climbers' hut at Horse Camp, a 720-acre parcel within the Mount Shasta Wilderness of the Shasta-Trinity National Forest. Horse Camp is a popular base camp for climbers and hikers on Mount Shasta. The property is owned and operated by the The Sierra Club Foundation, a tax-deductible foundation, IRC 501(c)(3). Shasta Alpine Lodge was dedicated on July 4, 1923 and is constructed primarily of indigenous materials including volcanic rock and Shasta red fir. Located at an altitude of approximately 7950 feet, Horse Camp offers low impact camp sites, a seasonal source of fresh water, and emergency shelter in the Lodge. During the late May through September climbing season Horse Camp is staffed by friendly, knowledgeable caretakers. "The Mission of The Sierra Club Foundation is to advance the preservation and protection of the natural environment by empowering the citizenry, especially democratically-based grassroots organizations, with charitable resources to further the cause of environmental protection. The Sierra Club is the vehicle through which The Sierra Club Foundation generally fulfills its charitable mission." bring at least one quart of water per hiker as there is none at the trail head nor on the trail itself. 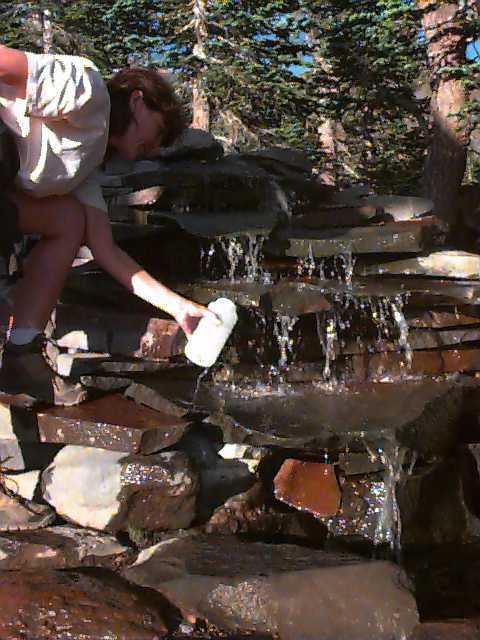 In summer, the spring at Horse Camp ensures a reliable supply of fresh water. There are plenty of cleared campsites after the snow melts out. A fire ring in front of the hut offers climbers and campers a place to socialize on summer evenings. The Phoenix solar-powered, composting toilet converts human waste into a non-toxic end product, making it easier to practice low impact camping. 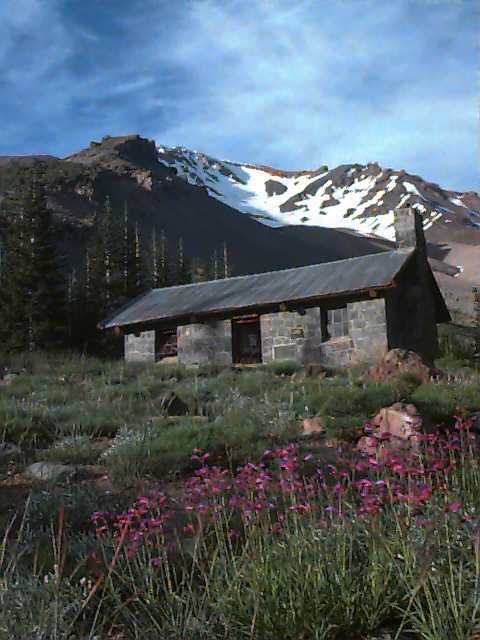 The hut itself houses a guest register, a small library of mountain books, and displays pertaining to Mount Shasta, including a lost and found board for climbers. and to prevent your nifty gear from being chewed!!! Each year many groups of students enjoy visiting visiting Horse Camp, and being inspired by the wilderness. Email Linda C. at the following adress: "linda at chitwoodenergy dot com" to reserve a date and time. When your school group's reservation to visit Horse Camp is confirmed, support materials and wilderness guidelines will be sent to you. A caretaker will be there to interact with you and your students and to answer your questions. Each caretaker has a wealth of outdoor experience to share. The Sierra Club Foundation works closely with the Mt. Shasta Ranger District of the U.S. Forest Service and at your request we may be able to arrange for a visit with one of the wilderness rangers in coordination with your hike to Horse Camp. Horse Camp is supported by donations to The Sierra Club Foundation, and we are suggesting that school groups voluntarily donate $1.00 per visitor. Donations may be in cash or in one check for the entire group and may be deposited directly into the donation tube inside the cabin at the time of your visit. 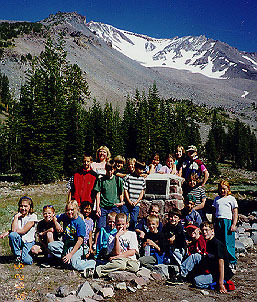 Hiking to Horse Camp is a tradition for many elementary school classes in Siskiyou County. Please contact us at your earliest convenience to reserve a date for your class, or if you have any questions. In the winter season there is no daily caretaker presence at Horse Camp. The winter caretaker sees to it that the entrances to the Lodge and the composting toilet are kept free of snow. The spring is not maintained during the winter months, so visitors must provide their own water. Skiers, snowshoers, and climbers must be properly outfitted and experienced in winter wilderness travel. Winter conditions on Mt. Shasta can be harsh and unforgiving. Webpage design, text (except Misson Statement) and photographs copyright 1997-2004 by Bob Musgrove.